I’ve always believed that people who take part in daytime phone-ins either have too much time on their hands, don’t have jobs or don’t get out of the house enough. Which of these apply to Deputy Prime Minister Nick Clegg I’ll leave to the audience to decide, but his strategy to take part in a weekly phone-in on London radio station LBC looks like a mark of desperation. Currently with the lowest poll ratings of the leaders of all three major parties (which is saying something), Clegg’s strategy is to appeal directly to voters by appearing on LBC. After all, his spin doctors must have mused, it was his appearance on the first televised party leaders debate before the last election that pushed the Liberal Democrats up the polls and ultimately helped them into power. So, let’s simply repeat the exercise and people will forget the last couple of years of government, and any policy changes, and just connect to Clegg the man. Obviously the whole point of a phone-in is that you have no idea what you are going to be asked. The plus point is that you can get the chance to talk about a wider range of subjects, but normally people on phone-ins aren’t giving up their time to call in and praise you. Hence Clegg suffering a verbal kicking in his first week on the radio. This may improve as he builds a rapport with the audience, but the randomness of live radio was shown by the headline news picked up by the press – Nick Clegg has a onesie, but hasn’t worn it yet. Having a senior politician on every week is a no-brainer for LBC – it boosts ratings, increases profile and, by broadcasting via the web, means it can reach a wider audience. However, whichever way you look at it, Clegg is not reaching the right voters – hundreds of miles from his constituency and not on a national platform. He’d do better (and show a keener grasp of new technology) by hosting a web chat or using social media to increase his credibility. 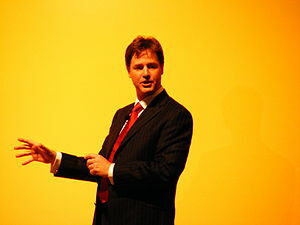 One of the basic reasons that Clegg impressed in the televised debates was that he was a relatively fresh face against the well-known Cameron and Brown. He hadn’t got the baggage they had and so looked good by association. The combination of years of government and being the only politician on show is always going to weaken credibility. However it is a brave move from the Liberal Democrats who realise that from a communications point of view they need to do something to differentiate themselves and rebuild their fortunes. What next – sending him into the Big Brother house or chairing Have I Got News for You?